Not so long ago, in a galaxy not too far away, there were two civilizations at war. Both were at war because the leaders of both wanted more and more power. Both were advanced and mined the stars. Both had an extensive fleet of powerful ships — everything from fighters to transport ships, to destroyers, to planet annihilators. Each ship obviously had it's strengths and weaknesses. The fighters were fast, maneuverable, and could hold relatively powerful weapons, but had very little protection for the pilot. The transport ships resembled modern day aircraft carriers. They were large, slow, heavily armored, and not very powerful on their own, but could hold many fighters within. The destroyers were smaller than capital ships, and much larger than a fighter. They were slow, have a lot of armor, and a lot of ship-to ship firepower, but would be easily defeated if sent against planet based defenses. The capital-sized planet annihilators held insanely powerful burst weapons. These ships were extremely slow, and sitting ducks in ship to ship combat if unguarded by fighters or destroyers. A well piloted fighter could potentially destroy one if it shot at the right spots. However — put a large, slow target in front of a planet annihilator, charge the weapon, and say buh-bye. It could shoot through a few destroyers, penetrate the transport ships behind them, and still do significant damage to planet based defenses that the other ships were guarding. Two vast civilizations at war, big ships, powerful battles. Lying politicians striving for more power urge the war on. All ships have weaknesses — nothing is safe from all attacks. A lone soldier in one of the armies, (call him Bob,) becomes fed up with the lying politicians' struggle for power. He takes his fighter, disables the tracking system, and flies off during the night. (night in space, really? -yah.) A few months into his journey, he sees another ship in the distance. Its appearance is of nothing he has ever seen. A message suddenly appears on his highly encrypted top secret communication device thingy, which should have been restricted to his army only. "Greeting hu-man. Why come you to realm?" Bob considers trying to trick the strange beings, but thinks better when he considers that they were able to communicate with him on his highly encrypted communicator thingy, which means that they are beings with obviously far superior intelligence. He replies, "The leaders from where I come from only care for power. They have torn apart my once peaceful homeland. I was a soldier in their armies, and deserted out of sheer disgust." The strange alien being replied, "In realm, there is peace. You be quite extraordinary to be escaped undetected from your fleet. For your hu-man race is quite dumb, but they do posses some smartness. We a civilization that strives to knowledge, to understand everything. You possess knowledge of the hu-mans. We will welcome you." Bob lives with the alien civilization, who turns out to be quite advanced. He shares with them everything he knows of the humans, and is educated himself of matters that the greatest scientists from his home would not have even guessed. One day, the king alien, (who is a few hundred centuries old), says to Bob, "I see that during the years you have been in realm, your leaders not ceased meaningless squabble. For much as I know, I not comprehend why they would keep their meaningless fighting. I decide to end it for them. I not, and entire race not do it. We much more important things to discover — to understand. But you a hu-man. You understand them. You end meaningless war." Bob had trouble comprehending this, but managed to say, "But… How? In every battle I was in before, the sides were very well matched. Even if I could convince all of one army to side with me — after deserting like I did, there is very little chance I could lead them to victory"
The alien king replied, "You need no help. You will win alone." Bob still could not really understand this, so he asked, "and just how will I, alone, win? the fighter I came here in is probably outdated — I was a good pilot, but I am no where near good enough to win the entire war!" The alien king replied, "I see to it — you be well prepared." The alien king has the smartest members of his race build Bob a ship — A ship that the smartest scientists form his homeland could never have imagined. The armor, being a composite form of X-Matter, Unobtanium, and Handwaveidium, is indestructible, incredibly lightweight, and extremely rigid, and can be quite thin. It can be set to reflect incoming energy weapons, and can shatter the hardest kinetic projectiles. The engines, powered off of a Qutonium reactor and expelling dark energy, can propel his ship faster than anything else in existence. The engine can release its charged energy in a burst powerful enough for the ship to lurch forward at speeds sufficient to warp space and create new wormholes. Due to more Unobtanium and Handwaveidium, Bob somehow does not implode from the acceleration. The power of the weaponry on Bob's shiny new ship is (as the alien kind described) "Tested - the energy broke many of best instruments and made testing chamber very melty. You will find it easy for Sustained fire - last a few thousand years before depleting reactor core." With Bob's invincible ship, would he be able to take over the galaxy? If not, would he even be able to successfully stop the war? And if he did stop the war, would he be able to make everyone peaceful again? Bob could end the war. Keep in mind that ending the war is different from winning the war. Also remember that the enemy of my enemy is my friend. All he has to do is fly into the middle of a space battle and let fighters from each side blast away at his ship for a while. As their most powerful weapons don't even damage his ship's paint job, he can casually break through their defensive lines and buzz each side's command ship; all without firing a shot. After he is certain that he has both sides' attention and while his ship glows under the combined firepower of all of both sides' planet annihilators, he can finally pause and deliver a message over open radio. "I am an advanced scout for the Krull Armada, which rules the Ten Galaxies! Under the Krull Articles of War, I am required to inform you that all of your home planets have been chosen for conquest. You have one Krull year to surrender or a thousand ships more powerful than this humble scout shall make you surrender. One Krull year is 117 of your years. I will return at that time to receive your decision. Use the time well." ...after which Bob flies off in a random direction and then when he is safely beyond their sensors, returns to the realm to live happily ever after. Meanwhile, back on his home worlds, his former friends and enemies have a lot to think about. They might choose to run away, moving the entire civilization to some distant colony planet. They might choose to fight, using the time available to build even more powerful ships and weapons. They might just collapse in defeat and start preparing to become slaves. But whatever they do, the one thing they won't waste there time with, is fighting among themselves. With a common enemy on the horizon, the previous war would evaporate, leaving them with more than a century of cooperative peace. And when Bob never comes back, a Krull year later, they may wonder how they got so lucky, but by then the previously separate civilizations will be so integrated and interdependent, that restarting the war would be impossible. It's unrealistic to expect a single person - or ship - to end the war. First of all, Bob and his ship can only be in one place at one time. He can't stop every conflict in the universe from happening, and he certainly can't intervene at a "local" level - for example a fight on a planet surface, or to protect a politician who is being assassinated. If he destroys both fleets and simply leaves, new fleets will be built, and new wars will be fought. Bob can blow any enemy out of the sky (figuratively speaking), but can he win the hearts and minds of the people? After he's done slaughtering their sons and daughters (you know, the crews of those fleets) will the people want to listen to this mass-murdering psychopath (as he will surely appear to them)? However, if he doesn't destroy the fleets what's to stop them continuing just as they had before? Simply targeting the leadership can still inflict massive collateral casualties, and even then, if the population is indoctrinated enough, will it make a difference? When Bob shows up in his flashy, alien ship people are going to think only one thing: this guy is dangerous. He has the ability to unilaterally kill any number of people, destroy any number of ships. He might refrain from doing so, but he has the ability, which will frighten people. Politicians will, of course, play on that. If Bob learned new and wonderful things while living with the aliens then why doesn't he share his knowledge with the rest of the human race? Why doesn't he try to make everyone's lives better, rather than selfishly keeping the ship only to himself? Come to think of it, just how safe is that ship of his? What sort of safeguards against mass destruction does Bob have on board? Don't the people think that Bob should submit his ship to a thorough government safety inspection? Better yet, shouldn't the ship be managed by the government, as a traitor who abandoned mankind is surely not the right person to be in charge of such a craft? Basically, if Bob opens any sort of political debate he is going to get creamed. Sure, he doesn't have to leave the ship (and get killed), or anything like that, but he won't be able to avoid being painted as a scary, alien-loving, humanity-abandoning boogy-man. His public image will be manipulated, distorted, and he will be vilified. The aliens are clearly very smart, but they are not very wise if they think a single war-ship can end humanity's in-fighting. Bob's best bet is to convince them to build him not a single war-ship, but a carrier-style of craft with manufacturing capabilities. He should be able to manufacture not only alien ships, and equipment, but also human designs (maybe it can have a nanobot-manufacturing-engine on board?). You can nerf this in various ways by setting a limit on the construction materials he has available, etc. Then Bob should return home in complete secrecy and start recruiting people who share his mindset of wanting the wars and political manipulation of their governments to end. He can build a shadowy organization of spies, politicians, army officers, etc. who are sympathetic to his cause and share his goals. Bob can at that point found the Republic (cue the Star Wars theme) - a political/military faction that people can align with (an alternative to the militant governments which currently exist). He can use the alien tech to communicate with his agents in secrecy, and use his manufacturing capabilities to build the equipment they need. When he advertises his existence to the people of the universe he will have an entire organization ready to represent him among them, and to fight his political battles. Imagine ships deserting the fleets to join his cause. Entire planets declaring their allegiance to him, etc. It all hinges on how his agents go about spreading just the right rumors, etc. I am here to hear proposals for a reasonable peace. If you can agree, fine. If you can't I will decide the peace terms--and attack the government of any side that does not go along with them. If somebody doesn't comply he flies through their capital at very high speed. If the replacement government is still stupid he flies through at even higher speed. Sooner or later the people will select a reasonable government. Could Bob take over the galaxy? Bob's problem is not his spaceship. Yes, it's completely indestructible and no match for any armada of any size. Bob cannot be putting down every rebellion against his rule and also ruling the galaxy: he is one man and one man has finite time and running a sub-planet sized country is already a full time job  much less one that covers multiple planets spread across 400,000 cublic lightyears of space. If he attempts to delegate his power (like any government for a group larger than about 3 people) then it will be uprisings against his delegates and his delegates do not have invincible ships with which to enforce their rule. So while Bob can quell any rebellion simply by showing up, his problem is that he cannot be everywhere at once. His best bet is to act as the ultimate peacekeeper between large-scale, stable governments. With Bob's invincible ship, would he be able to take over the galaxy? No. The invincible ship can still only be in one place at one time. Taking over an entire galaxy requires maintaining a persistent presence/authority over each notable inhabited system. One person cannot do such a thing in any meaningful way, no matter how fast their ship can travel. Information still only travels at the speed of light, so all a population would need to do in order to shirk his rule would be to wait until he jumps away to the next system, and then they can go back to doing whatever they feel like. It would be years, decades, centuries, millennia, or longer before Bob finds out about it, unless he jumps back. And unless your galaxy only has a very small number of systems, it's impractical for Bob to jump around constantly trying to keep tabs on everyone. The point is, Bob can only project force/authority in one place at a time. That's not sufficient for controlling an entire galaxy that doesn't want to be controlled. If not, would he even be able to successfully stop the war? In terms of ending active hostilities between armed interstellar spacecraft, sure, if he's careful. The number of ships involved in the war is finite, and Bob can destroy them with impunity. As long as he can find and destroy them faster than they can be built, he can stop the war in its current form. Assuming there aren't so many that he expires from old age before being able to kill most of them. Of course, there are logistical/intelligence gathering challenges in that the fleets may be difficult to track down, especially once they realize that there's an invincible ship that's hell-bent on destroying them. And also risks for Bob in that although his ship is invincible, he is not. One assumes that at some point he has to leave his ship to resupply, interact with others, or just because he's tired of being cramped in a fighter ship all day long. When he does that, he's vulnerable. And then there's the problem that destroying the interstellar warships won't necessarily bring an end to hostilities, which is basically the next question. And if he did stop the war, would he be able to make everyone peaceful again? No. As per the first question, Bob's ship doesn't give him a way to maintain the sort of presence that's needed to make large numbers of people do what you want over the long term. He can destroy their ships, he can go full genocide mode and wipe out planets one by one until everyone is dead, but he can't make billions of people spread across the galaxy do what he wants long-term. Say he kills all their ships; will that end hostilities between the parties involved? Or will it just be a temporary impediment to their ability to kill each other? Maybe instead of ships they'll start firing long-range FTL missiles at each other's planets. Or, since Bob is targeting warships, maybe they'll load up passenger ships with antimatter bombs and try to stealthily crash them into enemy population centers. Or load up passenger ships with troops, and wage a traditional ground war since space warfare has been denied to them. Stopping a war takes a political solution. It requires addressing the grievances that caused the war in the first place, in a way that the populations of both belligerent factions can generally agree with (or one side becoming the absolute victor, and subjugating the other). That's hard to do when all you've got is one guy with a very big gun. He doesn't have the right tool for building lasting peace. He can slow down the conflict by removing weapons from it, and perhaps he can temporarily redirect it by getting both factions to turn on him as a common enemy (see The Watchmen for a good example of this), or remove weapons in a lopsided fashion to cause one side or the other to win. But he can't guarantee peace by virtue of having a fancy spacecraft. On one hand, the ship has one weakness, just like all the others. In this case, it's the pilot. Eventually Bob is going to die. Bob's ability to use the ship to change the face of the world is limited temporally. Space is big, and unless the warring factions created some glaring weakness in their interstellar defenses (like an unprotected exhaust vent), you're not going to be able to put enough firepower down to really affect anything. On the other hand, Bob could be smart. There are many martial arts which center around permitting the opponent to undo themselves, such as Judo, Aikido, Tai Chi, and others. All of them concentrate on letting the opponent put themselves in a position where a small movement actually can shift a galactic balance. Tai Chi, for instance, has an aphorism, "Use four ounces to move four tons." Bob would need to take this kind of thinking to heart. Its also possible that the galaxy can't be saved by just Bob. These arts typically are designed so that Bob can at least create a little garden of peace which can grow with time, shaping the galaxy long after his death. However, the exotic hero stories associated with these arts demonstrate that sometimes the universe can actually revolve around one soul, if for just one brief moment. If you're making an exotic hero story, maybe this fits the bill! While Bob's ship might be small, it can now be in many places at once. He really doesn't have to do more than guide his ship to be between every shot that is fired between the two combatants. Eventually, they'll either get tired of fighting (and not actually hitting anything), or ally and turn their attention against him, both of which have the desired outcome of (temporary) peace. Assuming the aliens granted him extended/eternal life, he simply has to stay alive as a guarantee of mutually-assured-impotence, and the war will effectively cease. Even if they didn't grant him extended life, all he has to do is train an apprentice (preferably a clone, so that he will come out with reasonably similar motivations as Bob), and have that person continue the task. Power at a point, while he could unbalance a fight, he can win battles, but he can't win a war. He can only be in one place at a time. He doesn't have an intelligence network to say where that place should be. While he can win a fight, he's not really going to be noticed doing it if it's a large fleet battle situation. This means that he can only win fights he starts or fights that go on for long enough to hear about them before they're already over. The best he can hope for is to cause enough trouble that the factions unite against him. Flying though a planet would be a good way to get that attention. The same specifications on a dreadnought that blocks out the sun as it orbits a planet and a crew of thousands yes, no questions asked. It's like picking up two kids who are fighting, banging their heads together and saying "sit down and talk, sort this out". The size of the ship makes people think twice, there's no hiding it. The psychological effect allows him to enforce a "pax britannica"
The crew compliment eliminates his primary military weak point, that being himself. Kill me and 10 will take my place and all that jazz. The crew compliment allows him to build an intelligence network. He can put his ship right where it needs to be, smack between the front lines of a full fleet battle that's about to kick off. It gives a neutral location for holding talks. This is how you really end a war, by talking. One man in one little ship? I'm afraid it's not going to work out. The size and resources of empires at war mean that there'll just be too many places he needs to be and no way of knowing where they are. The lone hero is not realistic in imperial combat. The answers so far have overlooked one dreadfully obvious way in which Bob could end the war. He could pick a side. The two sides are evenly matched, but Bob's ship will completely out-class any battle group he goes up against. So what does this mean? Whichever side he sides with will suddenly have the upper hand, by a very large margin. Almost every battle from that point on would have Bob's side leading with Bob, and their otherwise evenly matched armada following after to mop up whatever Bob doesn't annihilate. Eventually one of two things would happen. (1) Bob's side would systematically capture every region from the other side, or (2) the other side would surrender. Either way, one side wins and the war ends. The best option is from The Day The Earth Stood Still. Behave, or else. The "or else" doesn't have to be instant, it doesn't even have to be 100% guaranteed. But if you do enough to get the attention of Gort (or Bob in this example), you're dead. As Klaatu says in the film, all the various races up there don't get on. But the presence of an "or else" makes sure it doesn't spill over. The two warring civilisations don't have to be friendly, they just have to be not fighting. I do foresee Bob getting very tired with putting out all sorts of local fires though. And unless the two tribes can decide to stop the war, Bob may well die of old age and it all kicks off again. An invincible fighter can only do so much. You need a strategy to even the playing field. Instead of indiscriminately killing other pilots (some of whom may well be childhood friends), the pilot should build a network of informants and use that information to secretly guide the political system towards peace. There are likely large parts of the political system that are good. It's the corruption that needs to be weeded out. The pilot needs a leader that can be trusted. That leader must not know that the pilot exists, because that leader must never become corrupt on their way to power, and if that leader knows the pilot and has come to an agreement with him to get into power, that leader is by default and definition corrupt. Instead, the leader must be a peace worker, probably low-level, who the pilot can then guide into positions of power through strategic assassinations and attacks. It could be done, but would require a lot of covert work, and the pilot would be socially isolated for a long time. The emotional damage to the pilot may be so much that the end game no longer matters to him anyway. Bob may be aware that a menace can be more powerful than an attack. As already mentioned in other answers, since Bob is alone, he does not have the time or firepower to fight everywhere at the same time. However, he can very efficiently menace everybody at the same time. An analogy to help understand is a typical western scene : there is a cowboy with only 6 bullet against 12 bandits with a knife each. The cowboy can not kill them all, but he can actually deter them to fight him, or to fight one another. Therefore if Bob proves his firepower to the belligerents and make clear that he will destroy whoever engage a fight, he may very well end the war. Of course one of the belligerent may envisage fighting everywhere at the same time to overflow Bob, but the waste would be huge, and it may as well let the other belligerent win the war. It is the true hard deal in my opinion, but is (I think) beyond the scope of the question. No he cannot rule the galaxy. He might be able to kill everyone in it, but otherwise he has now way to enforce any decision he makes. Any leaving of his ship could result in his death - he's not immortal and invulnerable outside his ship. If planets, or other ships ignore him, he might kill them, but that is all the effect he can have. Any other edicts could be ignored hoping that he will tire of killing things without result. In the Star Wars Legends Canon, there IS actually such a ship. In addition, the main weapon was a special type of resonance torpedo that can even make low-mass stars go supernova. the ship was destroyed when it ventured too close to a black hole. My point is that everything can be beaten, and unless you're going to break the laws of physics like a child that makes up the rules as you go along just so you can't be beaten, so can your "invincible space ship". Humans are an inventive lot, so they can and will find a way to defeat you. Most organizations have a single leader at top by definition and even if it is designed with shared responsibilities to combat that, Bob can enforce changes in structure with his invincible fighter. As long as he have enough time and nobody can stop him, all he needs is to select stronger faction, take control, enforcing any chain of command changes if necessary and then suppress resistance if he doesn't want to absorb it into his organization. "He can't be everywhere at once" - yes, sure. But he doesn't need to. His strong organization would be able to take care of problems by itself and Bob himself would only select biggest crisis at every single moment and interfere there. Many people did this through history, controlling vast armies and big countries with their only problems being vulnerable to those who wanted to remove them from power or to natural death. Invincible fighter eliminates first problem - Bob only needs to be always be under its protection or have same invincibility be extended to combat suit on board of this fighter. And while you original post doesn't mention immortality, considering technology behind invincibility and that leader of alien race seems to know a thing or two about living for a long time, he might ask aliens about eliminating second problem too. There have been all sorts of memos about weaponry and so forth, but it comes down to one very important factor---Bob and his lone starship are opposing two unimaginably powerful military complexes. And military forces LIVE, BREATHE, and ENDLESSLY PROMOTE SECRECY. "Bob's Battlestar" could turn 100,000 starships into jagged asteroids, slaying millions in the process. BUT THE CIVILIANS WOULD NEVER KNOW. Not even the "stellar task-forces" in adjacent "Quadrants" of space would ever learn the truth about their destroyed comrades. The higher-ranking officers would slap "ULTRA" security clearances on the debacles, covering up the slaughter with ten metres of adhesive-backed "Classified" paperwork; laying on 500 kilogrammes of rapid-dry "Restricted Access;" promptly following up by submerging the whole event in five million litres of "Deliberate Cover-up." Afterward, not even the gods would have access to all the facts! Bob's ship would have to hack into communications and entertainment satellites to be able to TRY to speak to the civilians. I said TRY. With two determined military complexes making Bob and his Battlestar seem as "fictional" as the "X-Files," SO FAR AS THE PUBLIC IS CONCERNED, there's nothing he could really do. Whatever he does "To" the Fleet, stays "With" the Fleet. He could scrag 2/3rds of all craft, and aside from the great increase in widows' and families' "condolence letters," no-one would know of the true "tides of war." So far as "Modern Warfare" is concerned, the adroit application of Security Classifications changes "The Public's Right To Know" into "The Military's Right To Conceal." The military routinely conceals absurd things for asinine reasons! And will then try to still conceal the "reality" with extra helpings of lies! At the end of the day, I've my doubts that any of the principals involved know what's REALLY true; but that's the norm . . . . It depends on what you mean by invincible. There are certain things that you just cannot protect against. For example, if he got hit a blob on antimatter, some of his ship would combine with the antimatter and annihilate. That results in pure energy. Just one gram of that equals Hiroshima. Now, lets say that humanity builds a torpedo filled with 100 kg of antimatter. It's most likely that Bob's ships will just combine with the antimatter, leaving him sitting in open space without a ship. If that wasn't enough, then keep in mind the radius of the explosion. That kind of blast would be so powerful that within its center the bonds holding atoms together would be ripped apart. Thus, nothing is truly invincible (while still obeying the laws of physics). Bob uses the human trait of achieving in-group harmony by being aggressive to out-groups. Bob goes home and tells both sides of the conflict of the masterful alien race and how advanced they are. He convinces the powers-that-be that the alien race is a huge threat, and demonstrates their awesome power using his ship, which he claims to have stolen off them. Faced with this existential threat, the two sides decide to stop the conflict between them and focus on preparing a pre-emptive strike against the aliens. The war machine keeps turning, economic activity is way up, people are happy but afraid. The human race is at peace again. Let me state that as the other answers mentioned, just his invincible space ship would not allow him to conquer the galaxy. But if you add outside assistance, cleverness, diplomatic skills; he still might be able to accomplish this goal. Hitler, Napoleon, etc. all succeeded in creating a vast empire without an invincible spaceship. 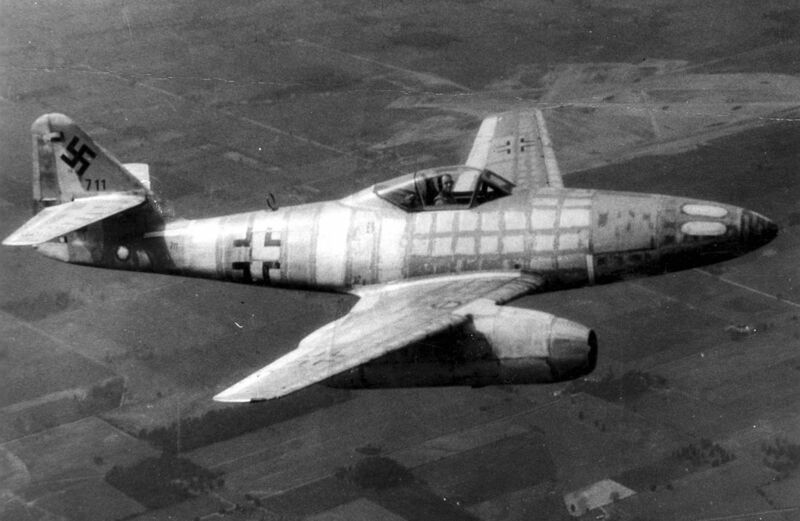 During the last year or so of WWII, Germany started flying the Me 262 - the first combat jet fighters. In the air, they were extremely formidable. After the Germans really learned how to fly them to maximum effect, they became nearly impossible for the allies to shoot them down. ...the only reliable way to destroy the jets, as with the even faster Me 163 Komet rocket fighters, was to attack them on the ground or during takeoff or landing. Luftwaffe airfields identified as jet bases were frequently bombed by medium bombers, and Allied fighters patrolled over the fields to attack jets trying to land. Even a ship invincible in combat could be destroyed when refueling, rearming, being maintained, etc. Even worse, it could be stolen. The people who your pilot was trying to conquer would most certainly look for means of neutralizing the ship's capabilities without taking it on directly in combat. It seems likely to me that Bob is going to have some problems in unexpected ways. Sure, his ship can't be destroyed, and he might even have unlimited firepower. But what happens when he wants to step out of his ship for any reason? What about food, company, etc? If he has to take on a supply of food, he might get poisoned. There are quite a number of things that could happen. He's going to have to sleep, and if the system isn't configured correctly for when he sleeps, well, something might happen. Sure, Bob could do impressive in a few battles, keeping the conflict from continuing on, but eventually, he's going to be noticed, and someone's going to do something clever to get him out of his ship, or sneak on to his ship. And when that happens, well, someone else has an invincible ship, etc. Not the answer you're looking for? Browse other questions tagged warfare weapons spaceships civilization science-fiction or ask your own question.